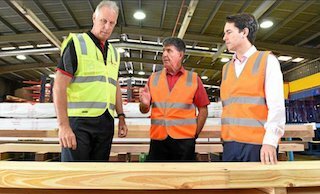 Hyne Timber has just announced a significant expansion to its Glue Laminated Timber (GLT) manufacturing capability in Maryborough, Queensland. Already a significant manufacturer of GLT in addition to softwood timber products, this expansion investment with the support of a Queensland Government Jobs and Regional Growth Fund will launch the company into a globally competitive product offer. The new state-of-the-art manufacturing plant will accompany the existing plant in Maryborough’s Industrial Estate which is now in its 40th year of production. This announcement comes as engineered timber manufactured from plantation softwood is increasingly preferred for larger scale commercial and residential construction projects due to its superior sustainability and environmental credentials. Hyne Timber CEO, Jon Kleinschmidt said investment to increase manufacturing capability has never been more timely. “GLT is the talk of the design and construction industry, but a lack of competitive Australian supply options has prevented many projects from using it. “Increased capability here in Australia will be a game changer for the construction sector and a very positive area of growth for Maryborough.” Mr Kleinschmidt said. Construction of the new plant is expected to commence within a matter of weeks.